Catalan pro-independence supporters gather near the Palau de la Generalitat de Catalunya, Barcelona, Oct. 27, 2017 (AP photo by Emilio Morenatti). “I ask all Spaniards to remain calm. The rule of law will restore legality in Catalonia.” That was Spanish Prime Minister Mariano Rajoy’s response on Twitter to the declaration of independence announced on Oct. 27 by the Catalan secessionist government of Carles Puigdemont. It was also a prelude to Rajoy, hours later, invoking Article 155, a provision in the Spanish Constitution that allowed Madrid to assume direct control of Catalonia, the culturally distinct region of 7.5 million people in northeastern Spain that is wedged next to France. Article 155 had never been used before. 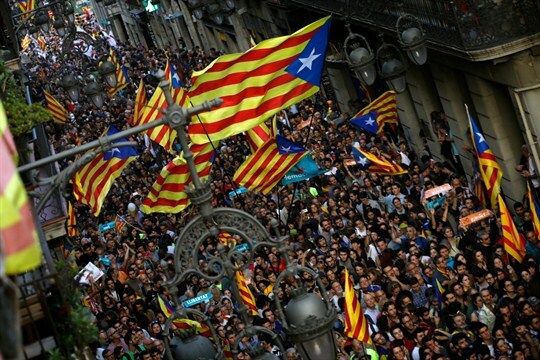 Under its authority, Madrid removed from power the Piugdemont administration, took over the Catalan police and ordered new regional elections for Catalonia within six months. Piugdemont’s prosecution on rebellion charges could follow.